VOA's Victoria Macchi, right foregound, speaks to Damas de Blanco leader Berta Soler, left foreground, in Havana, March 20, 2016. The city is steamy enough on a March night, but pack 60 people into a small living room: Handkerchiefs come out to dab glistening skin. A rotating fan whirs in the corner. The Damas de Blanco began arriving at the two-story, three-bedroom home a week earlier, coming from across the country to camp out in the house that serves as their headquarters, because they feared security officials would block them from leaving their homes ahead of a historic visit by U.S. President Barack Obama. One woman, from Guantanamo, hitched a ride with a trucker by pretending to be pregnant. Berta, the group members say. You want to talk to Berta. The group’s leader comes down the stairs, dressed in a white ruffled shirt. Berta Soler’s voice is raspy from days of interviews with journalists and from organizing her anti-Castro Ladies in White. They need to stay ahead of what they describe as constant surveillance from security agents who target dissidents. One Dama shares a recorded video on her phone of police pouncing on her and her husband earlier this month as they exit their home in the capital with their two young children, 5 and 7. Her husband was detained. Between the two of them, they are arrested regularly enough it seems to be a full-time occupation. For Soler, one of the group’s founding members and its elected leader, political resistance is a way of life. There are nearly 200 official Damas de Blanco. 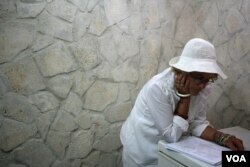 From their late teens into their late 70s, they gather on Sunday mornings in Havana’s Parque Gandhi to attend mass at St. Rita’s Church, dressed head to toe in white – the color symbolizing peace. When the group began in 2003, the women who joined were the wives, sisters, daughters and mothers of political prisoners. Now, the scope of their complaints has broadened to human rights overall. They oppose the Castro government. Obama’s arrival means more international press. It’s a moment to show the world what happens every week when they protest – the “repression,” they call it. A silent protest. Civil disobedience. 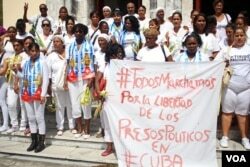 The days almost always end with some of the women and their supporters behind the bars of Cuban jails, sometimes for hours, sometimes for days. "We're not masochists. No one likes to be hit," Soler said. "But when we see that they hit us – unjustly, that they arrest us arbitrarily, it makes us stronger." “You can go in alive. You can come out dead,” Luisa Toscano-Quindelan, 61, says of the Sunday protests. She shows scars on her forearms she says came from handcuffs cinched too tightly behind her back. “They’ll have to kill me before I stop being a Dama,” she adds. The night before the milestone in U.S.-Cuban relations, more than a quarter of the group’s members have packed into the house. Some are excited, some nervous. A game of dominoes, some cigarettes, nail-painting, hair-styling – they distract themselves with chatter about non-political topics. They line up to shower quickly in the home’s two bathrooms. Berta also serves as the mother hen, delegating tasks. They arrange themselves two or three to a mattress, which are splayed across every room in the house and the front porch, facing a poster of Cuba’s revolutionary leader Fidel Castro someone hung about 40 feet away. There are no pillows, and only a few sheets to go around. A few of the men sleep on cardboard to cut the chill of the tile floor. By the time everyone settles in for the night, they will get about two hours of sleep. The capital buzzes ahead of the state visit. Fresh paint goes up; roads Obama will travel on are repaved and repainted. Police deploy around the tourist areas. Cubans mull over what the trip means. An end to the embargo? No, according to officials on both sides. More U.S. business in Cuba? Likely, with deals signed this week. For 34-year-old Jacqueline Herredia-Morales, one of the Damas, it validates a government she sees as unjust. In white dresses and skirts and pants and T-shirts on Sunday morning, the 55 Damas file onto a public bus for the half-hour journey to the usual protest site. It is a remarkable commute in its banality. Nothing bad happens. No police stop them. They feel strong. They feel calm. They are astounded at how well it’s going. Soler sees that constant surveillance as a sign the group has gotten under the government’s skin. “I feel important, that we bother the Cuban government that much,” says Soler. “That even though there are only a few of us, like the Cuban government says, we give them a headache." But she grappled with the peacefulness this Sunday. A nice break, she said. But it didn’t show how their lives are upended every week. Shouting ripped into the light-heartedness of the morning. A block away, a group member and her partner were walking toward the park when plainclothed police stopped them. A fracas ensued, the woman said later over questions about ID cards. Blood dripping down over eyes wide with disbelief, her boyfriend Lazaro Yuri Valle-Roca was forced into the back of a green sedan and whisked away. As of Monday morning, the Damas said he hadn’t been released. 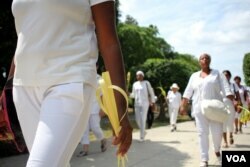 For 90 minutes, the women attended Palm Sunday Mass and emerged with palm leaves knotted into crosses. Nearby, the media flocked to a shouting match between a counterprotester and a supporter of the Damas. “I love the revolution,” the woman shouted. “I love the president. Forever. And you should do the same. “What they are doing, it isn’t ethical!” she concluded. The Damas marched down the boulevard, silently as always. They returned to Parque Gandhi, along the same route as every week. And as usual, the police arrived en masse to take them to jail.